Designed to comply with the latest PCI specifications, the Fastcom: FSCC Universal PCI (PCI version 2.3) adapter will operate in both 5V and 3.3V PCI slots. This means the card will work in the high speed PCI-X slots commonly found in most new servers, as well as the standard PCI slots in desktop PC’s. This flexibility allows for a single serial interface board to be used across a wide range of different types of computers including both current and future computing systems. 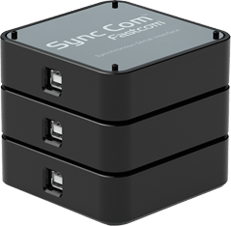 The Fastcom: FSCC adapter is the one of the most advanced synchronous communications adapters in the industry. The Fastcom: FSCC supports data rates up to 20 Mbits/s. The Fastcom: FSCC is a dual channel adapter, with each one being individually configurable to use HDLC/SDLC, ASYNC (using 16C950 UARTS), orFastcom®: X-Sync protocols. Although similar to the ESCC and SuperFastcom families of adapters, the FSCC expands on our previous adapters. The most notable expansion is the longevity of the components of the board. Faced with the inevitability of obsolescence, Commtech decided to put an end to the lifespan problems that plague most computing customers. We designed a serial communications controller with our customers’ needs in mind, and built a card around it. Wholly designed and owned by Commtech, Inc, this FPGA based SCC has most of the features that you are used to seeing in a quality Fastcom product. It also includes a few new features that come directly from customer requests. If the existing FPGA technology is ever discontinued by the chip manufacturer, the design can simply be re-targeted to the next generation of FPGA chip with no impact on compatibility. The SuperFSCC card features bus-mastering DMA; therefore, it greatly decreases the amount of interrupts that must be serviced by the host CPU, thus freeing it up for other activities. By utilizing this DMA, the SuperFSCC is able to stream gapless, full duplex data at the full 50 Mbits/s1. The standard FSCC card is only able to perform the same task at around 20 Mbits/s. The standard card is capable of operating at rates up to 50 Mbits/s with data bursts. It cannot sustain higher rates without generating gaps in the data (e.g. idle between frames). BAUD RANGE: Using the user independent programmable clock generator in conjunction with the baud rate register, virtually any baud rate from 1 bps to 20 Mbits/s can be attained. Click here for Fastcom: FSCC drivers. Click here for the Fastcom: FSCC product manual.